The items being transported on the roof rack must be reliably attached – there is the risk of an accident. Always secure the load with appropriate and undamaged lashing straps or tensioning straps. Distribute the load evenly over the roof rack system. The handling properties of your vehicle change when you transport heavy or bulky items on the roof rack system as a result of the centre of gravity being shifted and the greater area exposed to the wind – there is the risk of an accident. The style of driving and speed must therefore be adapted to the current circumstances. Avoid abrupt and sudden driving/braking manoeuvres. Adjust the speed and driving style to the visibility, weather, road and traffic conditions. The permissible roof load, permissible axle loads and gross permissible weight of the vehicle must not be exceeded under any circumstances – there is the risk of an accident. Only roof racks from the ŠKODA Original Accessories range should be used. The fitting instructions supplied with the roof luggage rack system must be observed when handling roof racks. On models fitted with a power sliding/tilting roof, ensure that the opened sliding/tilting roof does not strike any items of luggage transported on the roof. 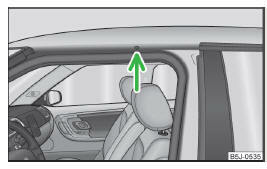 Ensure that the boot lid does not hit the roof load when opened. Always remove the roof luggage rack system before entering an automated car wash. Ensure the roof aerial is not impaired by the secured load. The increased aerodynamic drag results in a higher fuel consumption. If the vehicle is not factory-equipped with a roof rack, it can be purchased from the ŠKODA Original Accessories. Perform the assembly and disassembly according to the enclosed instructions. Observe the information regarding the assembly and disassembly in the enclosed instructions. The maximum permissible roof load (including roof rack system) of 75 kg and the maximum permissible total weight of the vehicle should not be exceeded. The full permissible roof load cannot be used if a roof rack system with a lower load carrying capacity is used. In this case, the roof rack system must only be loaded up to the maximum weight limit specified in the fitting instructions.